I know, I know, the focus should be on the clothes, but have you ever wondered about the props? 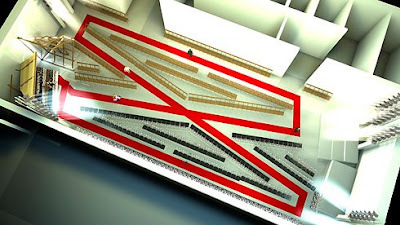 I mean, the design of the runway, how it gets done in accordance with the clothes and the idea of the collection. II the interview Alexandre de Betak states that he importance of the set which must be done in such a way that it only emphasises the clothes. Still, an inadequate realised scenery would send the entire collection into outer space. And not in a good way. Also, he mentiones that his job is to enhance the identity of a designer. He won't do something that was already requested and done for another designer though. Even though most of his shows are extravagant (see the Victoria's Secret shows), it's nice to see he is keeping himself a down-to-earth person. Step by step, a new attitude of shifting towards recycling and eco-friendly items pops up in the fashion industry as well. Alexandre adjusts to that and comes up with adequate solutions. 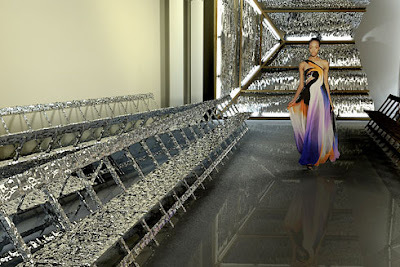 For example, using the same 18 fluorescent tubes, only arranged in a different way for the Rodarte shows. Talking about recession is the it thing now, so of course the subject was brought up. The designer says this situation only leads people to being more creative. Financial resources are restrained, but it's a situation we need do deal with one way or the other. Alexandre de Betak has been in the industry for 15 years now, taking fashion addicts by a storm each time attending shows or seeing the decors. Spectacular as they look in photos, I bet they are more impressive in real life.